Constipation can be a killer - The truth about food and medicines. Although there is an article on this subject on a previous page it was only when a good friend was suddenly taken to hospital that i realized that constipation for people forced to stay in bed, even for a short period of time, can present a real problem that needs to be addressed as quickly as possible. Often constipation is not considered of prime importance by doctors and medical staff as they are too busy treating whatever is wrong with the patient and frequently they do not even bother to ask if she or he has this problem. In fact, it can have a very serious impact on the health of the patient especially after surgery. Patients are at risk of having an embolism ten days or so after surgery and they may die just because no one thought to ask them if their bowels were working. Most people in hospital or confined to bed for some reason are reluctant to ask for something to alleviate the constipation as this invariably means taking yet another medication on top of those being prescribed to treat them. However, there are other natural ways to tackle the complaint which are gentle and yet very effective. Surgeon Captain T.L.Cleave advocated the addition of fibre to the diet in the form of unprocessed organic wheat bran to be sprinkled onto soups or porridge or indeed almost any food when needed. There is no dose as such but you can start with a tablespoonful and adjust the dose as required. This will ensure a gentle movement of the bowel. A consultant surgeon, who is also a personal friend, prescribed bran to his post operative patients and the result was so effective that Cleave commended it in his book "The Saccharine Disease". In stubborn cases, bran can be taken in water or half a glass of milk. Cleave insisted that naval ships under his command load sacks of organic wheat bran on board to combat the constipation of the crew on long sea voyages. On one famous occasion there was nearly a mutiny when the crew found, just before sailing, that their supply of bran had not been replenished. Eating prunes and fresh or dried figs are two other natural and effective ways to alleviate constipation. The raw prunes (avoid those in vegetable oil) are best soaked for about an hour and then cooked for 6- 8 minutes until they are just soft. Fresh figs can be eaten as they are whilst the dried variety can be softened in a little water over night to make them more palatable..
Organic wheat bran can be purchased in any health food shop. Prices vary slightly but a 375 gram bag, which will last quite a long time, will generally cost less than £1 ($1.50). 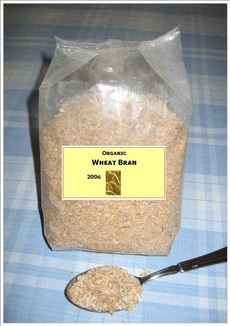 One of my readers who is a nutritionist, suggests that oat bran is equally effective for those who may wish to avoid wheat.